prevention tips, skin cancer prevention, UV rays are the leading cause of skin cancer - facts, what is sunscreen? what is sunblock? July means fun in the sun, whether at the beach, ball game or company picnic. It also means over-exposure to ultraviolet rays – the leading cause of skin cancer. Actually, 1 in 5 Americans will develop skin cancer during their lifetime. And that’s not necessarily from long days in the sun. It only takes a few minutes for ultraviolet rays – commonly called UV rays – to cause skin damage. How many minutes does it take to damage the skin? No matter how long you plan to spend in the sun, remember to use a product that has the highest amount of SPF – Sun Protector Factor – to protect your skin type. Not sure was SPF is? It’s just a simple formula – minutes to burn without sunscreen times the SPF number – that lets you know how long you can stay in the sun without burning. Sunblock – Contains ingredients that physically block ultraviolet radiation. 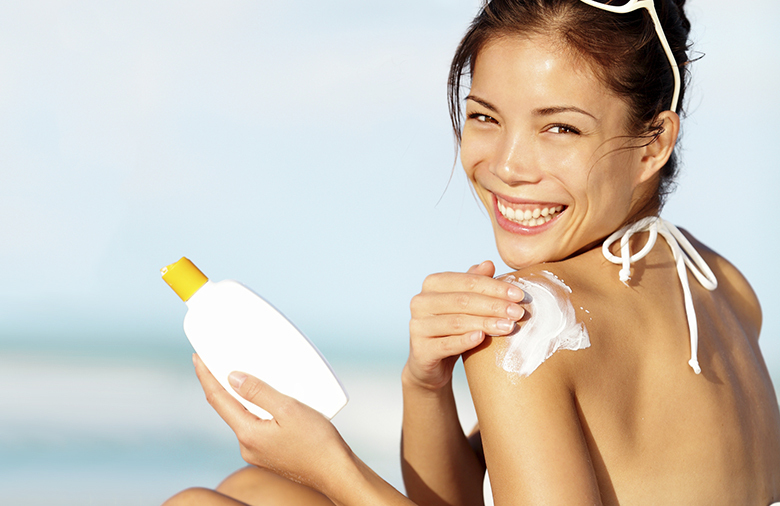 Sunscreen– Contains ingredients that act as filters to reduce UV ray penetration. Wear protective clothing, such as long sleeved shirts and pants, sunglasses and brimmed hats. Putting on sunscreen just once isn’t enough so remember to reapply as directed. It’s not just arms and legs that can burn – ears, neck and lips can be damaged too – so remember to apply to every exposed skin surface. Install window film on your car, home and office windows. Avoid driving or riding in convertibles. If you’re interested in seeing this information as a colorful and easy-to-understand way, here’s our recent infographic. Then, consider either sending it to a friend or printing and posting for others to see.